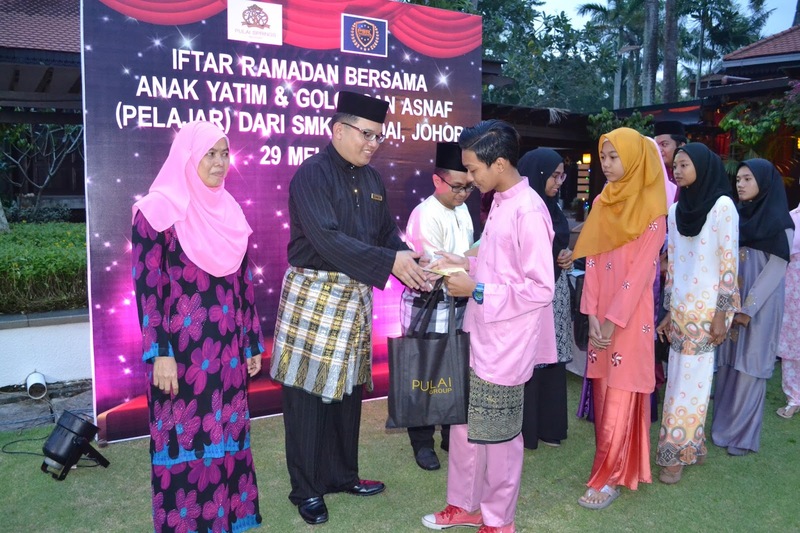 Thirty students from SMK Skudai were treated to a breaking-of-fast meal at Pulai Springs Resort recently. They were accompanied by their parents, guardians and teachers for a relaxing and enjoyable meal at the Gleneagles Terrace Restaurant. The students, identified from needy families in the neighbourhood, enjoyed a sumptuous spread dubbed Buffet ala Citrawarna where appetizers, soups, local favourites, Raya delicacies as well as Arabian treats and Chinese dishes were presented in a mouth-watering and colourful palette. This annual charity event was part of Pulai Springs Resort’s Corporate Social Responsibility Programme in caring for the less fortunate in the neighbouring area and giving back to the community. Aged between 13 and 17, the students were mainly orphans and children from under-privileged families, who were guests at the resort for the very first time. On arrival, they were welcomed by resort General Manager, Sunny Soo, and chairman of the resort’s Sports & Welfare Club, Mohd Najib Sedik, along with committee members and resort staff. The event kicked off with a word of welcome from Soo who said that the resort team believes in the spirit of sharing and caring especially with the young guests during this festive season. 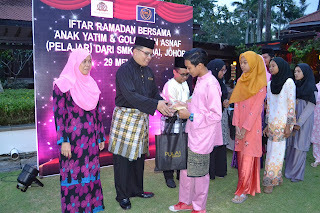 Hosting the Ramadan buffet was just one of the ways of sharing this wonderful festive season with them. “This is an annual event and Pulai Springs Resort looks forward to celebrating many more occasions with the less fortunate and share the company’s success with them,” he added. Soo presented the students with duit raya in the sum of RM50 each, contributed by the resort as well as their Sports & Welfare Club. 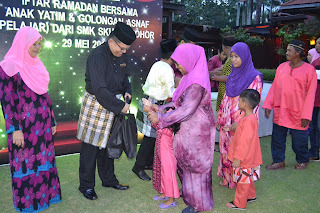 The students also each received a goodie bag of stationery sponsored by Schwan-STABILO Marketing and food items of cereals and chocolates that were generously donated by a resident of Cinta Ayu Apartments in Pulai Springs Resort. The 30 families represented also received a package of essential food items that included rice (5kg), flour, sugar, coffee powder, condensed milk and cooking oil, to help them prepare for the coming Hari Raya celebrations. The event continued with a prayer recitation by a resort staff, followed by the breaking of fast with the tradition of eating dried dates before going into Maghrib prayers. Then the students returned to the restaurant to enjoy a leisurely meal from the buffet and happily helped themselves to more of their favourite items. To add some fun to the event, the resort staff played a quiz game with the students where prizes were given away for the right answers. Then a group of vocally talented male students presented Nasyid songs at the close of the event. With stomachs satisfied and arms loaded with goodie bags and gifts for the festive season, the young guests and their families left with pleasant memories of their special treat at the resort. Made up of more than 100 dishes that Executive Chef Ian Lim and his culinary team designed in six mouth-watering menus, Buffet ala Citrawarna will be served at Gleneagles Terrace Restaurant from now till June 23. In the space of just 10 ten days, I’ve been to the Amari four times – on May 9, May 15, May 18 and May 19 – for various events and their soft-opening on May 15. You may be wondering just what is or where is Amari? The Amari Johor Baru is a new city centre 242-room hotel, a brand with its origins in Thailand that celebrates the colours and rhythms of modern Asia. Locals, familiar with JB’s Rex and Lido cinemas, will nod in agreement when I say that the hotel is situated on its former site. Just as in the days of those landmark cinemas, the Amari also enjoys convenient access from two routes – from Jalan Trus and the other, via bubble lifts from Jalan Wong Ah Fook. My first visit to the Amari was as a guest of the Rotary Club of Johor Baru who held their regular meeting at the hotel for a peek into its new premises. I was told to drive into the carpark via Jalan Trus and after parking, I found the elevator lobby and headed up to the hotel lobby on level six. Aware that visitors to this spanking new hotel may be unfamiliar with the place, staff were positioned in the lobby to direct us to the appropriate destinations. When asked where I was going, I said, “Rotary” and was instantly ushered to a foyer between the Library and the Idea Room, where the meeting was being held. Rotarian friends greeted me warmly and while I was chatting with them, we were joined by hotel General Manager, Wayne Lunt. When we were introduced, Wayne did not hesitate to tell me that he is familiar with my heritage stories in My Johor Stories! During the club meeting, Wayne was invited to give a brief introduction to the Onyx group of properties and hotel Amari Johor Baru. Using visuals projected on a screen, he introduced the group’s various brands like Amari, Ozo and Shama, names that will soon become familiar here. He also outlined the rationale behind the Amari’s tagline, Colours and Rhythms and the group’s policy in exercising inclusiveness with the diverse practices in Asian cultures. After a much anticipated completion of the project on Sungai Segget, the hotel was then putting on the finishing touches to get ready to open its doors to welcome their first guests. Besides the Breeze Spa which offers a range of treatments in single and twin treatment rooms, the hotel has banquet and meeting facilities not only in the Idea Room but also in two adjacent function rooms which they aptly named Rex and Lido. Wayne told the Rotarians that he read about the Rex and Lido cinemas from My Johor Stories and it was a tribute to the city’s old landmarks to name their meeting rooms after these cinemas. The mention of our old cinemas seemed to elicit an agreeable response from the Rotarians, many of whom were familiar with the city’s culture and heritage. Datuk Freddie Long, who grew up at Jalan Ungku Puan, could not resist interrupting Wayne’s presentation and volunteered a personal anecdote about his experience in the Rex cinema. The cinemas, as we know, were built next to Sungai Segget, the main waterway that flows parallel with Jalan Wong Ah Fook into the Johor Straits. If heavy rainfall coincided with the high tide, water level in the river may rise and overflow its banks. Sometimes during show-times, the flood water may even creep into the cinema. But locals like Long who are familiar with this natural phenomenon, would not be alarmed by the rising flood waters. They would coolly lift up their feet and rest them on the seats and continue watching the film! Later, when I shared Long’s anecdote with my uncle, he laughed because he too had a similar wet experience in Rex! Uncle Arthur said in those days, young men wore footwear commonly called Japanese slippers or thong slippers with rubber soles. He said cinema-goers who had the nasty habit of removing their footwear, were caught unawares and as a result, they had to walk home bare-footed! This was probably because they were too deeply engrossed with the movie while the flood waters silently rose in pitch darkness and their rubber slippers left on the floor were just swept away! After this brief but interesting digression, Wayne continued to share more information about the hotel and its facilities. Then I joined the club members on a tour of the hotel to check out some of their rooms, the swimming pool and gym as well as take a peek into the spa. In less than a week, I was back at the hotel again to witness its soft-opening on May 15. The event culminated with lunch at the Amaya Food Gallery and I had the privilege to taste some of the finest Thai food served in a hotel. I thought they should have a good range of Thai fare - after all, the hotel is a Thai brand! Little did I know that I would be back in the hotel again so soon! On May 18, I was there again for a breakfast-meeting. So there I was at the Amaya Food Gallery, this time for breakfast. I must admit that my attention was focused on the meeting and not the food, so I made a mental note to sample more from its buffet spread when I dined at the Amaya again. The very next day, I was at the Amara again for a prestigious event – the preview of the final episode of design reality television series, The Apartment: Rising Stars Edition – before the Malaysian audience would view it on AXN channel the following night! I don’t know about the others but I was rather chuffed that the entire series was filmed at Bandar Seri Alam, a modern township right here in our state of Johor. The broadcast of this series to a worldwide audience would also bring a view of the developments here into the living rooms of countless viewers! Once again, I failed to appreciate the buffet dinner specially catered for this event because I was occupied with meeting the Malaysian contestant, Winston See, truly an inspiration to aspiring designers here. His valiant attempt to create a unique design in the final challenge was indeed commendable and maybe I’m bias but I was even more proud of his efforts because he was born in JB and lived in Kulai before his family moved back to Shah Alam! With such an exciting start with the Amari in JB, I’m sure there will be ample opportunities to experience more of the hotel’s facilities and hospitality again, maybe even sooner than expected. And while the Rex and Lido cinemas may hold fond memories for locals who lived through the cinema era here, the Amari built on its site, exudes a sense of nostalgia not only from the familiar names of their meeting rooms but also because its vicinity has a wealth of heritage. Get set for a reptile revolution at the Singapore Zoo and River Safari as a new reptile exhibit and home to an array of remarkable reptiles dubbed RepTopia, is unveiled. 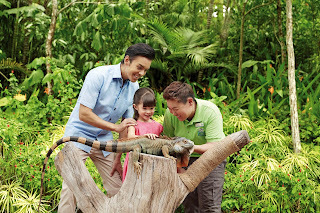 Every weekend from May 27 to June 26, visitors will enjoy close encounters with reptiles as they discover and appreciate these spectacular and scaly creatures through a spectrum of engaging activities. The diverse range of activities include interaction with a reptile keeper for an enlightening animal enrichment session, meet-and-greet with the RepTopia mascot, a handsome chameleon, and have hands-on fun with reptile inspired craftwork. Part of the RepTopia experience is the 13th edition of Zoolympix, themed Zoolympix 2017: Reptile Revolution, where visitors are invited for an experience designed to turn your ewws into awws! 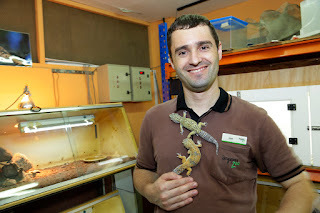 This is an exciting trail with games and activities to discover the skills, defensive moves as well as cool facts about these charming and awesome reptiles and get you to change your perception about them. At RepTopia, visitors will soon warm-up to our cold-blooded friends as they see how these creatures crawl on their bellies, smell with their tongues and sleep with their eyes open! So make a date with the panther chameleon, the Gaboon viper and other equally amazing reptilian friends to learn more about them through exciting and engaging activities. 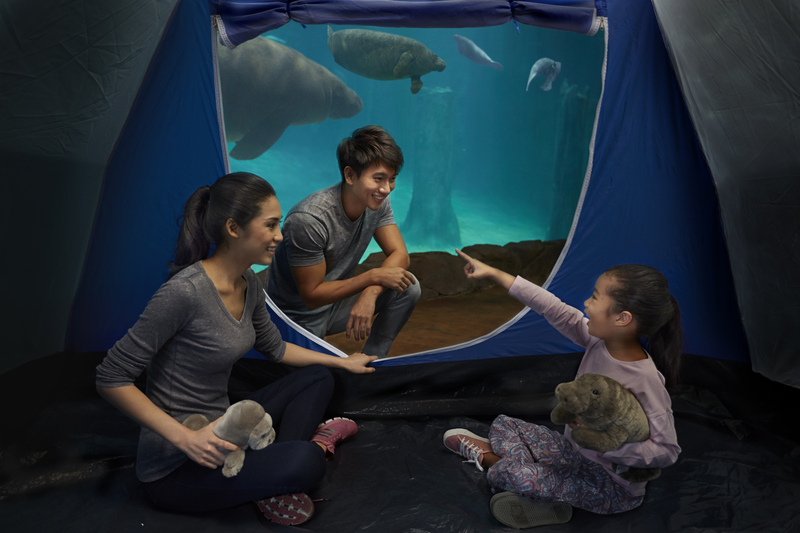 This holiday season, the first ever Camp Fest 2017 is organized over the weekend of May 27 to 28 for animal lovers to have an unforgettable experience at one of three camping options at Night Safari, River Safari and Singapore Zoo. 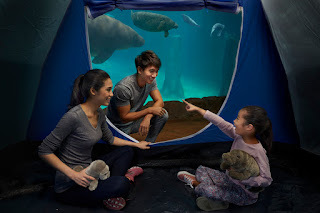 There is a choice of Glamping in the Wild @ Night Safari, RiverBed & Breakfast @ River Safari or Safari Snooze at Singapore Zoo for overnight packages that include tents for groups of four, five or 10 guests. As one day is not enough to enjoy all the attractions at Jurong Bird Park, you can sign up for a one-year Friends of Bird Park membership at the price of one-day full price ticket. A series of specially curated treats and activities are lined up in a Members Extravaganza for the June holidays. 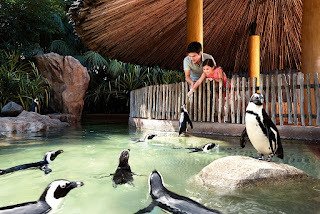 These include an exciting Penguin Encounter where guests are invited to come face-to-beak with these tuxedoed birds. From June 3 to 26, visitors can look forward to enjoying activities like Jungle Jewel Chit-Chat, meet the park’s mascot, Sunny and other Star Birds as well as a bird-themed puppet show and craft workshop. 1. RepTopia is the new reptile exhibit at Singapore Zoo. 2. One of the reptiles you can see at RepTopia is the panther chameleon. The contest to win ten  sets of tickets, closes on June 1 so send your answers to email: corpcomms.szg@wrs.com.sg with your full name, IC number, email address and telephone number. Winners will be notified by email. Legoland Malaysia Resort hosted the largest Star Wars 40th anniversary celebration in Asia with the biggest Star Wars Imperial March in the region, last Saturday. Lego Star Wars Days are here again at Legoland Malaysia! At 9am, the sun was brilliant in the cloudy sky. I spotted many Star Wars fans clearly identified by their character costumes among the crowd gathered at the resort entrance. Wearing a hooded gown in solid black, the event Master of Ceremony, Malaysian TV personality Nazrudin Habibur Rahman, told the audience in an amplified deep voice that today he would be known as Darth Naz. As the event was about to start at 9.30am, the sky turned overcast but a light drizzle did not deter die-hard fans who stood their ground, waiting for the Imperial March to start. The event kicked off with a dance routine by the Dancing Stormtroopers which also featured a few moves by the cute version of the Dark Lord, the Lego Darth Vader. The largest celebration for Lego Star Wars Days at the resort was launched by State Tourism, Domestic Trade and Consumerism Executive Councilor, Datuk Tee Siew Kiong. Together with Legoland Malaysia Resort Director of Operations, Casper Bonavent, they unveiled a portrait figure of Princess Leia, created in Lego bricks as a tribute to the late Carrie Fisher who is best remembered by her role as the People’s Princess, the toughest rebel in the galaxy. The stage was then set for the much anticipated Imperial March by over 100 costume characters in the largest Star Wars Parade of the region. They came from galaxies far, far away – gathering at Legoland Malaysia Resort – from Singapore, cities in Malaysia and other Asia-Pacific nations, to show their allegiance to either the dark or light side. Decked out in screen-accurate costume replicas, I recognized characters like Jedis, Stormtroopers, Princess Leia and even a Chewbacca as well as a variety of villains – in all (ahem!) shapes and sizes. The Imperial March was divided into three; the first with familiar characters from the original Star Wars series followed by A New Hope characters and saving the best for last, the final group of the kids’ version of Star Wars characters. The threatening rain seemed to echo the vibe as the most recognizable (at least to me!) Star Wars character led the Imperial March into the event area – Darth Vader – who stood an impressive head and shoulders above the rest! Throughout the event, the Star Wars music theme by John Williams was played to create the right mood and now its loud strains perfectly matched Darth Vader’s bold strides. Later in the park, when I came face-to-mask with Darth Vader, I marveled at this fan’s attention to detail because his outfit came rigged with a distinctively breathy breathing tone! As the massive Imperial March paraded and paused to pose for photos, the rain was forgotten as the crowd surged forward for a closer look and to snap photographs of the colourful characters. who came complete with a drag-bag designed as R2D2 ! It was simply fascinating to see how these devoted fans went all out to dress to the hilt in replica outfits as their favourite Star Wars characters for the Star Wars 40th anniversary celebration in Asia. The celebration continued at Lego Star Wars Miniland, the only indoor Lego Star Wars Miniland in Asia, for guests to experience a special live storytelling of memorable scenes from the epic space saga – exclusively for the month of May. Star Wars fans not only enjoyed an exciting experience at Legoland Malaysia Resort but were also thrilled by the exclusive deals on newly launched Lego Star Wars Classic merchandise, only available here during Lego Star Wars Days. I also came face-to-mask with this Shadow Stormtrooper! For a minimum spend of RM300 on Lego Star Wars Playsets, shoppers will receive the coveted Lego R2D2. For purchases of RM100 and above of Lego Star Wars Playsets, shoppers may redeem an exclusive Lego U-Wing Fighter. Purchase of the ultimate Lego Star Wars Death Star will entitle shoppers to receive a free Lego Star Wars Kylo Ren Command Shuttle worth RM599.90. Planned with a variety of entertaining daily activities for the whole family, Lego Star Wars Days are on from now till end May 2017. Join the Jedi Academy and go on a Star Wars Trivia Hunt to find clues and answer the quiz. Have you noticed how the resort crew members wear a badge as a name tag? I also noticed that some of them have mini-figures attached to the badge. So keep your eyes peeled for a Stormtrooper mini-figure on a crew badge and when you find it, you can redeem a prize on-the-spot! For two more weekends, May 20 & 21 and May 27 & 28, guests at Legoland Malaysia Resort can look out for Star Wars characters and capture a photo memento with them. Spot Lego Darth Vader as well as characters like Princess Leia, the Jedi and Stormtroopers, who will be happy to pose for photos with you. For more info on promotions and activities, visit Legoland Malaysia Resort’s official website on www.legoland.com.my and stay connected with the resort via social handles Facebook and Twitter to find out more on online about Lego Star Wars Days activities and promotions. May the force be with you! Every fan's dream - a selfie with Darth Vader! I keep an eye on the clock as I drive from Johor Baru to join the Senai-Desaru Expressway just before Ulu Tiram. Because traffic is light, I arrive at the toll gates in about 20 minutes. It’s a smooth and scenic drive on the expressway and across the Johor River Bridge to reach Penawar Toll in only 45 minutes. I follow the queue of vehicles emerging from the toll plaza and easily spot the sign pointing to Sebana Cove. I’m familiar with Sebana Cove which established itself more than 20 years ago as a popular destination for golfers and was among the first in Johor to welcome yachts and catamarans to berth at its marina. Road works are in progress for upgrading the route to Pengerang into a dual carriageway and after a 30-minute drive, I pass through the guard post into the resort. Here, lush greenery and oil palms border the wide road that runs through the property recently refurbished and rebranded as Sebana Cove Resort. I slow down to read road signs and can’t help smiling when I see twin signs with illustrations of a monkey and a wild boar with captions below that read: ‘Do Not Feed’ and ‘Wild Boar Crossing.’ Amused, I drive on keeping my eyes peeled for possible sightings of wild boars and made a mental note not to feed those mischievous long-tailed friends! The road to the hotel and marina takes me through two roundabouts, pass the 18-hole golf course designed by course architect, Ted Parslow, and the sales gallery for Fairway residential properties and its show units, before I go past another guard post. I spot the clubhouse ahead with several double-storey blocks of buildings to my left and am struck by the architecture that features stone walls, timber framed windows and balcony railings with clay tiled roofs. I step into the airy lobby of the clubhouse with its soaring ceilings and I’m enveloped in a distinct sense of tranquility. It’s a warm day and I gratefully accept a welcome drink to quench my parched throat. As I walk to the seaside end of the lobby, I have a panoramic view of the marina with its neatly berthed boats. Two corridors lead off to the left and right from the lobby and my eyes are riveted to the signs with directions to the restaurant or pub. As I read the names, a picture of the theme that runs consistently throughout the resort, forms in my mind. The café and restaurant, Boathouse Tavern, overlook the marina while the Oyster Pond is a casual lounge on a level, just below the lobby. There are no oysters to harvest but a menu of snacks and drinks. On the opposite end of the corridor lies the Pirate’s Creek, a pub with live music entertainment while the Captain’s Cabin upstairs, is a karaoke lounge. Designed in wood, the décor in the pub is reminiscent of a boat’s deck featuring marine steering wheels and rope net curtains while the bar resembles a ship’s prow where its port and starboard sides are long counters flanked by bar stools. Thanks to my vivid imagination, I’m suddenly transported into a pirates’ hideout! To satisfy my curiosity about the resort’s name, I make a quick check which turns up an interesting reference to the earliest mention of Sebana by Greco-Roman astronomer, Claudius Ptolemy, whose second century world map marked Sabana as a trading port that linked South East Asia to India and Europe! I’m totally charmed by this discovery which connects the resort’s sea-going theme with ancient mariners and the scourge of pirates in a bygone era. Its low-density accommodation allows the resort to meet guests’ needs in a more personal manner, particularly with groups and long-staying guests. When I arrive at the Boathouse Tavern for dinner, I see groups of people wearing similar tunics, leaving the restaurant and later when I’m almost done with my meal, some corporate types come in to dine. I learn that long-staying guests include employees of corporations with investments in nearby sites. The versatile kitchen team is ready to meet guests’ meal requirements in choices that range from outdoor barbecues, hotplate shell-out platters to local delicacies and kueh for afternoon tea. For golfers, the Stay and Play package includes one round of golf with the use of a buggy, breakfast buffet and set lunch with one night’s accommodation on a twin-sharing basis. My dinner is one of their popular choices for group dinners – the hotplate shell-out platter, piled high with a variety of seafood and shellfish, and topped with a spicy chilli sauce. This seafood main course of squids and a variety of shellfish like crabs, prawns, scallops and mussels, is complemented by sides of pasta aglio olio and fried-rice. The platter of seafood, best savoured at leisure and in convivial company, is kept warm on a hotplate. One after-dinner pastime is to enjoy live music entertainment at the Pirate’s Creek or belt out a few songs at the Captain’s Cabin. It’s both fun and entertaining to see the bartender, who also doubles up as a karaoke deejay, encouraging guests to show off any latent talent! The next morning, after a hearty buffet breakfast in the Boathouse Tavern, I join a group of guests at the lobby to gear up for a close encounter with Nature. A route map for the bicycle ride is distributed and a quick scan shows a route on private roads that takes us out of the hotel compound but stays safely within the resort. From the map, I have an overview of the resort, designed around a private marina and nestled within natural greenery which is the habitat of a host of beautiful wild birds, including the hornbill and kingfisher. While the bird-watchers rent field-glasses or binoculars and the bikers rent bicycles from the reception at RM10 each, you can also opt for the resort’s sightseeing tours on their buggies, upon request. Armed with cameras and mobile-phones, everyone is ready to capture some amazing sights in the morning’s two-hour ride. The scent of salt in the fresh air is both exciting and invigorating as we discover a private helipad at the end of the route that takes us pass private villas. Heading in the opposite direction, we pass the Fairway residential developments and its sales gallery before turning off at the round-about into the golf club. On the route, bordered by jungle greenery, I go slow and pause ever so often in the hope of meeting a few foraging wild boars but instead, I see troops of long-tail macaques! Sebana Cove Resort presents Ramadan Selera Iftar from May 28 to June 24 at the Boathouse Tavern from 6.30pm to 10pm. Don't miss the fusion creation of yellow rice sushi-like items! Chef Mohamad Yan Muharram and Chef Hassan Mohd Yusof have created a range of 50 local and Arabian specialties including favourites like Sup Kawah Gearbox (beef), Kambing Moorabi (lamb) and Satay Celup, skewers of food savoured with a dip sauce. Diners can break their fast by feasting from appetizers, main course dishes to desserts, as well as Chef’s recommendations like Pucuk Paku Lemak, Tiger Prawn Sambal and Venison Rendang Kerisik. One must-try dish is their fusion creation of yellow rice sushi-like items topped with various ingredients like chunks of beef rendang, whole prawns, smoked salmon and quail’s egg halves. Prices are at RM78 nett (adult) and RM38 nett (child) with Early Bird Deal of three free with every purchase of 12 (adult) when meal vouchers are purchased before May 27. Two-storey walk-up buildings with 40 executive deluxe rooms and 20 studio suites. Situated in a resort township and nearby attractions are accessible by bicycle or buggy. Golf, boat cruise, swimming, sauna and gym. Nature walks, cycling, bird-watching and 100 berths for vessel docking. Low-density resort, matured landscaped gardens, marina views, in-room dining, wireless internet access and in-room safe. Executive Deluxe Room RM348 [Marina View] and RM300 [Garden View], Studio Suite RM468 [Marina View] and RM425 [Garden View], each packaged with breakfast for two. The family-friendly Gleneagles Terrace Restaurant at Pulai Springs Resort is an ideal setting for a relaxing and enjoyable breaking-of-fast meal this Ramadan. Buffet ala Citrawarna, served from May 27 to June 23 at Gleneagles Terrace Restaurant, is made up of more than 100 dishes that Executive Chef Ian Lim and his culinary team have designed in six mouth-watering menus. The spread certainly lives up to its theme, Citrawarna, where appetizers, soups, local favourites, Raya delicacies as well as Arabian treats and Chinese dishes are displayed in an attractive and colourful palette. The most eye-catching and tempting section must be where desserts vie for attention in a parade of cakes, jellies, pastries, puddings and fresh fruits as well as ice-cream and refreshing sticks of nostalgic ice-cream Malaysia. Look out for the ‘date tree’ where diners may help themselves to sticks of juicy dates which appear to be hanging on a tree! Fans of local desserts will be thrilled with Pastry Chef Nor’s warm Serawa Durian, steamed glutinous rice drenched in thick durian cream, an item that will satisfy all durian cravings. Diners can look forward to savour buka puasa favourites that range from local salads, pickles, meat, poultry and seafood to grilled meats from stalls as well as the barbecue and carving stations. Asam Pedas Kota Laksamana made with Ikan Pari or ray fish, is a main course item to enjoy with white rice. Other local favourites include nangka muda masak lemak or young jackfruit cooked in coconut milk and ikan keli sambal cili or catfish topped with chilli sambal. Traditional not-to-be-missed favourites must be kari ikan masin dengan ubi or salted fish curry with tapioca, ayam percik or grilled chicken and Minangkabau style beef rendang. For something Middle Eastern, try fragrant Nasi Arab served with condiments. To get into the Raya mood, there are servings of Nasi Impit or rice cubes to eat with traditional serunding or meat floss and beef rendang. For a comforting soup, enjoy the Soup Gearbox or Soup Daging (beef), a broth rich with herbs and spices, topped with sambal kicap and served with slices of French bread to wipe up every drop of delicious soup. Staff are on hand to serve bowls of Laksa Penang, rice noodles in a spicy but appetizing fish broth that packs a powerful punch from slices of chilli padi swimming in the broth! Over at the Barbecue Station, a whole roasted lamb will be carved while grilled chicken, lamb and fish are served with a range of sauces. Skewers of tender beef and chicken satay are enjoyed with rice cubes and condiments, drizzled in delicious peanut sauce. Fan of freshly fried items should head to the Frying Station for fried chicken, fried popia or spring rolls, fried keledek or sweet potato slices and exotic fried banana with cheese. Another interesting fried item at the Citrawarna buffet is dubbed Meatballs ala Pulai, their version of Swedish meatballs topped with brown sauce and savoured with mashed potatoes. Regulars at the resort’s award-winning Qing Palace restaurant will recognise some familiar dishes served in the spread including Butter Prawns and Lo Hon Chai mixed vegetables. Don’t miss their signature dessert – muaji – glutinous rice balls stuffed with ground toasted nuts. There is also a range of fresh greens like ulam-ulam kampong with a choice of traditional sambal sauces. In addition to piquant pickles, there are also an appetizing range of Malaysian and Thai salads or kerabu created in mango, beef and seafood varieties and also eggplant topped with sambal ikan bilis or anchovy sambal. This sumptuous meal can be savoured with teh tarik or Malaysian pulled tea and the pulled version of coffee! Diners will have the convenience of a designated room for their Maghrib prayers. Buffet Ala Citrawarna is priced at RM118 per adult and RM59 per child. Diners may buy dining vouchers from now till May 21 and save up to RM25 per person. Pre-purchased vouchers are priced at only RM93 per adult and RM46 per child. All prices include GST.